The project, its forms and the controls on those forms have information about them that can be edited in the Properties Window. If a change would affect the appearance of a form or control, the Design Screen will be updated. A short description of the property appears in the Help window below the Properties Window. BabelConfig The configuration file for Babel. See https://babeljs.io/docs/en/configuration for more information..
backgroundColor Sets the default background color for all forms. Can be a color name, #RRGGBB, rgb(R,G,B), or transparent. Also used as the background color for Chrome splash screens. backgroundImage Sets the default background pattern or image for all forms. Overrides the backgroundColor property. Works best if image is in the project folder. Do not use absolute paths. To stop image from repeating to fill the screen, put background-repeat:no-repeat; into the style property of Project Properties. Gradients like linear-gradient(#55aaee,#003366) can be set at design time or runtime. URLs like url(https://www.nsbasic.com/images/eiffel.gif) can be set at runtime only. browserwarnmsg Message which appears is app is run on an unsupported browser. If blank, the warning does not appear. See also browserWarningMessageAfterScript. copyright The copyright message. This will be placed in the generated code. 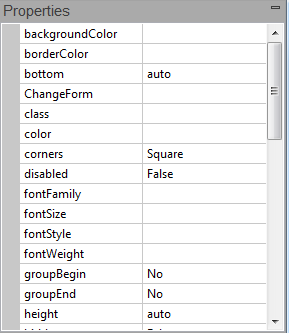 defaultformsize The default size used for new forms. If you want a size not on the list, set the height and width for each form in Form Properties. description Description of the project. Used in config.xml. enableAppScroll Allow app to scroll? Use for forms longer than the screen. See Making Apps which Scroll. Needs to be set to true for jQuery Mobile swipeleft and swiperight. enableBrowserArrows After ChangeForm, enable the back and forward arrows of the browser to move between forms. Defaults to false. eslintRules For syntax checking. A JSON configuration object that modifies the default style guide. See the Eslint Developer Guide to modify your rules. enableNiceLinks On servers where this is enabled, do not show '#' character in URL. If you are deploying to Volt, go into the Dashboard for your app and set Nice Links to true as well. Defaults to false. events Project wide events which are responded to. EULA The text of the End User License Agreement that the user has to agree to before the app will run. firstform The name of the initial form to display. If left blank, the first form is used. If the form specified no longer exists, it will be changed to the first form on the next deploy. fontfamily The default font for all controls. Default value is system, which uses the default font for each device. Android and iOS each have custom fonts: Roboto and San Francisco. To use a single font for all platforms, use something like Helvetica. homescreenTitle The title to be used for the app when saved to the Home Screen on the device. iOS only. icon/favicon The icon to be used when the app is saved to the Home Screen, as well as the favicon used in the browser tab. For iOS, it should be 180x180. Works best if the image is in the project folder. Do not use absolute paths. Unix file names must be used: you cannot include spaces or invalid characters such as colon (":") or parentheses ("()"). If ChromeSplash is set to True, make sure the splash folder is set up: otherwise, the icons will not display on Android devices. manifest A list of files to be saved with the project. See “Distributing your App”. manifestFile “appcache” or “manifest”. “appcache” is recommended for all new projects. obfuscation Name of the external routine to obfuscate the runtime code. obfuscatorSettings If obfuscation is set to js-obfuscator-custom, these settings are used. projectCSS Opens an editor window with CSS rules for the project. rtl Use right to left language on controls? script Opens a Code Window with the Global Code for the project. statusbar The appearance of the iOS status bar at the very top of the screen. If content is set to default, the status bar appears normal. If set to black, the status bar has a black background. If set to black-translucent, the status bar is black and translucent. If set to default or black, the web content is displayed below the status bar. If set to black-translucent, the web content is displayed on the entire screen, partially obscured by the status bar. stopOnError Show a MsgBox if error at runtime? style The style used by the body of the app. See the Style page for more info. Must be on a single line. title The public title of the program. Special characters like "&" are not allowed if compiling with PhoneGap. useStrict Do additional syntax checking at runtime, such as undeclared variables. version Version number of app. User specified. viewportFit iOS: How should the app cover the screen? auto currently same as contain. cover fills the entire screen. contain sticks within the safe area. BootstrapPath The path to the Bootstrap.Leave blank for the default, but if you have a custom build of Bootstrap, put the path here. If to a local folder, should end in /. Must be single line. BootstrapTheme The theme used by Bootstrap. Affects the appearance of all Bootstrap controls. jQueryMobileTheme If jQuery Mobile is used, the default theme. pathTo_jqWidgets The path to the jqWidgets files. Should end in "/" if local path. See this blog post for changing the path to a local folder. AppPublisher Must be a single line. EXE icon App Icon. Must be a .ico file. EXE title Page and Start menu title. height Height of app's window. Defaults to defaultformsize. width width of app's window. Defaults to defaultformsize. Window Style See WindowStyle for more info. BuildID The ID assigned by PhoneGap Build. configxml Configuration information for PhoneGap Build. Includes things like icons, splash screens, autorotation (orientation) and more. contentSecurityPolicy The Content Security Policy defines the security rules that the browser should enforce. The default is to allow everything, which is not sufficient for secure apps. Required by PhoneGap apps. This can be multiline for complex policies. Languages Languages supported if PhoneGap project. Splashscreen The default splash screen for PhoneGap apps. statusbarColor Background Color of statusbar as #RRGGBB. Can not be blank. See https://www.npmjs.com/package/cordova-plugin-statusbar. statusbarOverlay Should the statusbar overlay the app? Version Which version of PhoneGap to use. If blank, use the latest version. AppID ID of the app in Volt. Assigned automatically when deployed to Volt. Dashboard Access Allow the app access to user data on Volt, much like the Dashboard has. Domain The location of the app on Volt. For example, signon-controls-sharply.volt.live. Do not change this unless you are deploying to PhoneGap. id The name of the Code Module. script Opens a Code Window to edit the script. src Location of the external file this Code Module refers to. See the Properties and Methods page. This page was last edited on 21 February 2019, at 18:23.